The 82-game NHL season sometimes seems like it will go on ad infinitum. Players often describe it as a “battle” and a “slog,” like trying to run through a mile-long swimming pool or a deep, dense swamp. As fans, the games often blend together after a while; the individual matchups are still enjoyable, but a robust sense of “we’ve been here before” inevitably permeates the mind. Fans thus face their own dilemma: It can sometimes become a battle and a slog simply to remain completely interested. So, as we find ourselves with less than 20 games to go in the 2013-14 regular season and our interest perhaps teetering a bit, let us drive it right back up by taking a look at the best plays of this Chicago Blackhawks season. This has likely been the best pure passing play of the year for Chicago thus far. If you have been hearing “Keith is an overrated passer and his assist totals simply reflect the ability of his teammates” being tossed around as (flawed) justification for choosing another defenseman for the Norris instead of him, just bring up this play… or this one, which just barely missed out on making the list. Something about tic-tac-toe goals is so visually appealing. The one-touch pass that Keith pulls off here really is a good deal more difficult than a regular pass, and the quickness and smoothness of it all makes it truly beautiful to watch. The Minnesota broadcaster’s depressing lack of emotion aside, this was fantastic. On many goals involving the spinorama, the move itself isn’t exactly functionally necessary. This one in particular, though, stands out because the only way for Saad to get the puck to Kane was the spinorama, and he timed it perfectly. The pass was flawless; Kane hardly even needed to move his stick. Speaking of Kane, you might remember some highlights of his from past years that also involved this move: One against Dallas and the other against Anaheim. This play was so exciting that it made Pat Foley turn back the clock and reenter puberty, with his voice cracking all over the place. Sharp had already notched a hat trick before pulling off this two-way display. Combine the steal from Duchene, the perfect pass over Jan Hejda’s stick to get the puck to Toews, and the nice finish by Chicago’s captain and we have ourselves one of the most memorable plays of the season. This would have been #1 easily if Saad hadn’t fumbled the puck into Bobrovsky’s pads just before passing it off to Toews. 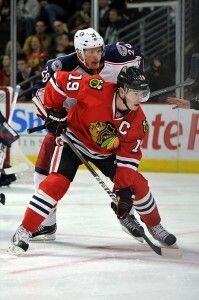 Toews has a bit of a knack for these, even more so than the typically far more flashy Kane. I imagine you haven’t forgotten this… or this… or this. It’s difficult to see any Blackhawk topping this for the rest of the season, especially when considering the terrible ice conditions that Toews did it on. Some have tried to minimize the goal’s impressiveness by pointing out it was against the much-maligned Brooks Orpik, but I’ve never bought that line of reasoning; we are looking for the prettiest plays of the season, after all, so why base judgments on anything other than raw aesthetic appeal? 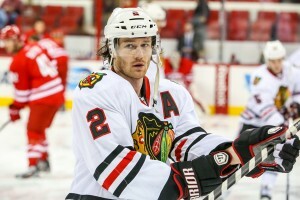 We’re enjoying the best period of hockey in Chicago Blackhawks history. There has been no shortage of incredible plays, and we’ll surely get to see a few more before the playoffs come around. Follow Sean Sarcu on Twitter or add him to your network on Google.